Angulo: Where does he go after the Kirkland beating? By Dan Ambrose: In losing badly to James Kirkland (30-1, 27 KO’s) by a 6th round stoppage last night, Alfredo Angulo (20-1, 17 KO’s) went from a fighter ranked to No.1 by the WBC to that of a mere contender who will have to work long and hard if he wants to get a title shot. Kirkland exposed Angulo and gave him one of the worst beatings you’ll ever see. Before the fight, Angulo was poised to get a title shot against the WBC junior middleweight champion Saul Alvarez in 2012. However, this loss has removed that possibility and has given Alvarez and his team all the reasons they need to avoid Angulo for a long time to come. Angulo fought well for the first minute of the Kirkland fight, knocking him down with a nice right hand and then going all out to try and end the fight. 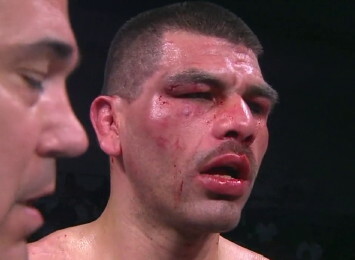 But after Kirkland failed to go down, Angulo was finished for the fight. He was on shutdown from that moment on, too tired to continue fighting other than as a punching bag. I’ve seen fighters run out of gas before but not ones that fail to get their second wind after a round of resting. But in Angulos’ case, he gassed out and stayed gassed out like a fighter much older than his 29-years. Kirkland was able to then pound the stuffing out of Angulo for the next five rounds until the referee mercifully halted the fight in the 6th to save the beaten and bloody Angulo from taking any more hits. So where does Angulo go from here? With the kind of punishment that he took from Kirkland, I don’t know that he’s going to be able to come back from this loss. I’m sure that Golden Boy will put him on the easy track for the next two years by putting him in with nothing but B and C level fighters in a backdoor route to getting a title shot. But that’s probably the only way Angulo will get one. He was already exposed by Kermit Cintron two years ago in a fight where Cintron easily out-boxed the slow Angulo. If Golden Boy puts Angulo in with anyone with decent hand speed and boxing ability you’ll likely see Angulo get schooled again. Boxing » Alfredo Angulo » Angulo: Where does he go after the Kirkland beating?